Tretja dimenzija Ltd is focusing on solutions based on our extensive experiences in computer vision, geospatial information visualisation and Cloud management. We are specialised in IT turn-key services applying agile methodologies supporting entire life-cycle of the project: from business requirements to handover. Tretja dimenzija Ltd is the author of the 3D scanning service PHOV allowing photorealistic reconstructions of scenery from digital photographs. Check out some of the models in our Sketchfab page. 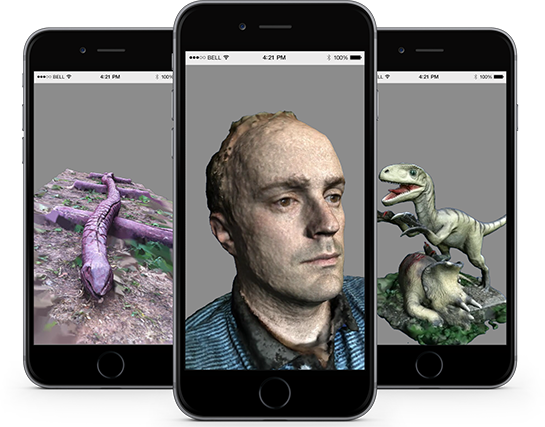 Mementify is a 3D scanning app for you iPhone. Take photos, upload to our Cloud service and enjoy your 3D models. Tretja dimenzija Ltd is supporting the development of a three-dimensional geographic information system XLAB Gaea+ and visualization solutions for the Slovenian Environment Agency (ARSO) and the Administration of the Republic of Slovenia for Civil Protection and Disaster Relief (URSZR).